Advocates of building with cross-laminated timber say the material helps save time and money on projects while also offering the opportunity to jumpstart a new industry in Oregon. Until recently, few people outside the building industry paid much attention to news about cross-laminated timber. A flurry of headlines this year — from the shelving of the 12-story Framework project to problems with faulty panels in the construction of Oregon State University's Peavy Hall — changed that. Cross-laminated timber — CLT for short — is made by stacking layers of timber planks at 90 degrees to each other, using adhesives to glue everything together and then pressing the layers to form a solid panel. Lightweight yet strong, the innovative material has been used as a popular building material in many parts of Europe for the past 25 years. CLT has been slower to gain similar ground in the United States, hampered in large part by a shortage of domestic manufacturers and building codes that have limited how tall buildings using the materials could be constructed. Despite those hurdles and the problems some projects have run into, CLT is slowly winning over developers, building professionals and even prospective building owners. At a time when the construction industry is facing a shortage of skilled workers and prices for building materials have risen sharply, advocates of CLT say using the material can help save time and money while promising to help Oregon build a new state industry. Among the most recent converts to the CLT bandwagon are Monique Little and the leadership team at First Tech Federal Credit Union. 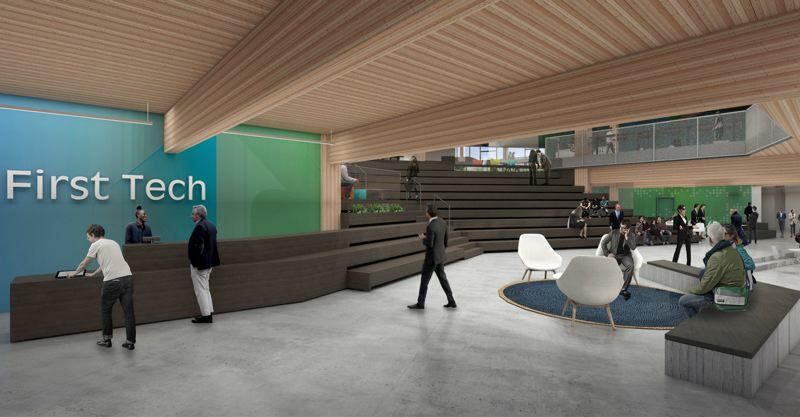 The financial institute is in the middle of moving 650 employees into a new main campus with a 156,000 square-foot, five-story "hybrid" building that features a make-up of CLT combined with a metal stabilizing system. Just a few days in the building, it already felt like home for the credit union's employees, said Little, who serves as First Tech's chief people and administrative officer. It was a different story, though, when the credit union first decided it was time, after 25 years leasing office space near the Nike campus in Beaverton, to build a home of its own. After finding a 17-acre site that included wetlands and a park on Brookwood Parkway in Hillsboro, the credit union hired Hacker to serve as project architect. Among the Portland-based architectural firm's first suggestions was that First Tech consider using CLT for its building. "Our first thought was, 'That sounds really expensive,'" Little said. "Building a building, in and of itself, was new enough (for us)." 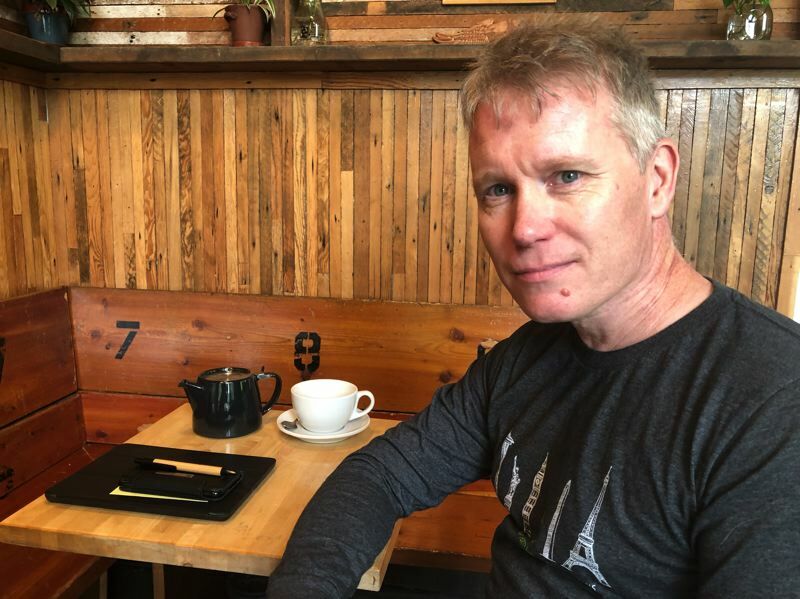 The concern about paying more in material costs for CLT is understandable, said Iain Macdonald, assistant director of the TallWood Design Institute, a collaboration between Oregon State University and the University of Oregon. "Usually mass timber is more expensive than the materials for concrete or steel structures," Macdonald said. "However, the savings are usually on the other end — construction savings and speed of construction." CLT panels are constructed off site and then transported to the project location, where they are then put together, a process Little said reminded her of building with oversized versions of a child's Lincoln Logs. The prefabrication aspect means fewer hands are required to construct a building — a relief for an industry struggling to find enough skilled workers. The process also reduces safety concerns, requiring mainly cranes to lift the CLT panels in place and battery-powered drills to connect them together. But the benefits and advantages don't stop there. "You have less (materials) deliveries, so it's easier logistically to coordinate," Macdonald said. "... Often you have less foundation work; the foundations don't need to be as robust because wood is up to 75 percent lighter than concrete." Although the First Tech project was Swinerton's first self-erected mass timber building, the general contractor completed the project in 15 months, compared with the average 18 months Little said most contractors had told her a similar non-mass-timber project would take. That shortened schedule helped shave the project's overall cost. First Tech declined to reveal the exact amount, but Little said the savings realized were approximately 4 percent, when compared with what it would have cost to use more traditional, non-mass-timber materials. "That's the first time Swinerton has built a mass-timber structure and they're already saving 4 percent. So, you can imagine as they get more adept at this and refine their system, they could potentially save more money," Macdonald said. Using CLT for projects doesn't come without risks, though. The First Tech building was on the way to completion when news stories started to appear that linked faulty manufacturing techniques to the collapse of a CLT panel in Oregon State University's Peavey Hall project. The panel, along with others for the project that investigators determined had similar issues, was produced by Southern Oregon-based DR Johnson — one of only two CLT manufacturers currently operating in the country. But the news didn't sway First Tech or its project team from their certainty that they'd picked the correct building material for their project. The team had looked at a range of CLT manufacturers and products, including possible local sources, before settling on a Canadian company with a long history of CLT panel production. The company, Structurlam, was brought into the project at the very beginning, a step that industry experts say is critical for a successful mass timber project. "We never had any doubt," Little said. When it comes to embracing mass timber products like CLT, Oregon is viewed as a state willing to push the envelope. Albina Yard, the first office building to use domestically produced CLT, for example, was built in Portland by local firm LEVER Architecture. Founded by Thomas Robinson, the firm has been linked to a growing list of mass timber projects, including the shelved Framework building. The state also lays claim to having had the first certified CLT manufacturer in the country. With those accomplishments to its credit, Macdonald says, Oregon is in a position to have mass timber products like CLT become a new statewide industry. But only if Oregon takes coordinated, deliberate steps now to maintain its early lead out of the gate. "What we have right now is first-mover advantage," Macdonald said. "Oregon has taken the lead in the U.S., and we can continue to lead. Or we can fall behind because there are some efforts happening in other (parts of the country)." A new CLT manufacturing plant is under construction in Washington state, for example, while another is expected to open in Alabama. Additional plants are planned in Maine. And that's likely just the beginning. "There's going to be an acceleration of this industry around the country in the next two to five years," Macdonald said. Earlier this month, Oregon took a big step toward firming up its hold on the title as a leader in the mass timber movement. The state made history by becoming the first in the country to adopt a new building code that will allow mass timber buildings to be built as tall as 18 stories, replacing an older code that placed a maximum limit of six stories on structures made with the material. The code the state adopted is based on International Building Code recommendations developed by the International Code Council, which is set to vote on adoption later this year. Oregon also is the top producer in the country of lumber and plywood, according to Macdonald. But even with that to its credit, other parts of the country may already hold an advantage over Oregon. "Sometimes the business regulations in some of the southern states are more relaxed, which allows new industries to move forward more quickly than in states like Oregon with more strict rules," Macdonald said. First Tech's new building will soon have more company in the Portland metro area. Beam Development and Urban Development + Partners last month broke ground on a six-story CLT office building on Southeast Martin Luther King Jr. Boulevard. Adidas reportedly is considering including CLT in an expansion of its North Portland headquarters. Meanwhile, the city of Lake Oswego is keeping CLT open as a possible building material for a new city hall. That project is still in the early stages, according to Jordan Wheeler, deputy city manager. "...Right now, (CLT is) something we'll continue to look at. 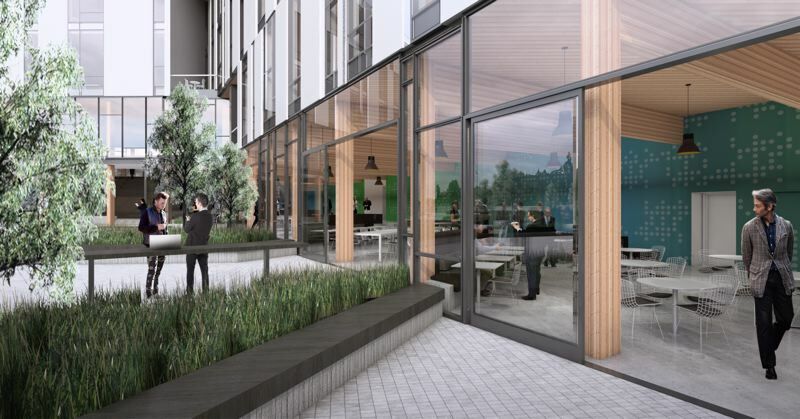 We haven't made any financial decisions on the use of CLT either holistically in the building or in concentrated areas," Wheeler told the Business Tribune. "As the design develops, it's something we'll price and see if it makes sense." That is something that LEVER Architecture founder Robinson says more developers and project owners need to keep in mind when it comes to mass timber. Materials like CLT can be more costly than traditional materials, and using them in a cost-effective way often requires more planning and attention to detail. "My advice to developers would be to look first at what motivates you and then find collaborators that share your goals and have the technical expertise to deliver," Robinson said.